Considering a move to Vegas? We’re guessing you want to know all about the cost of living in Las Vegas. 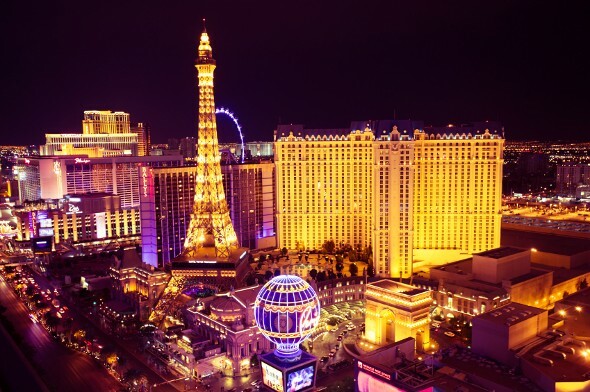 While it’s common to blow a bit of money on a fun-filled weekend in Sin City, anyone settling there for the long haul will want to follow a more sustainable spending plan. The amount you’ll have to spend in Las Vegas will depend on your salary and on the local cost of living. Here’s what you need to know about how much things cost in Vegas. Las Vegas experienced a big housing boom in the years leading up to the financial crisis. Unfortunately, the city was hit hard by the recession and the housing crash that came in 2008-2009. Foreclosure rates in Las Vegas soared. Things have stabilized now, however, and home prices are climbing once again. They’re still not back to the heights they reached during bubble years like 2007, though. 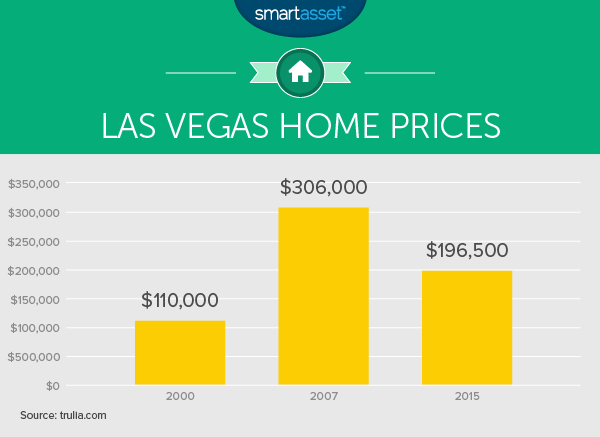 Take a look at the chart below to see how Las Vegas housing prices have yo-yo’ed over the last fifteen years. If the ups and downs of the Las Vegas market don’t worry you, here’s what you should know about buying a home in the city. According to trulia.com, recent pricing data puts the median sale price of a one-bedroom Las Vegas home at $186,147. Two-bedrooms come in at $169,808. Need three bedrooms? Expect to pay around $245,251, with four bedrooms costing $366,556. Renters in Las Vegas face a less volatile market, and rentals in the city are relatively affordable. According to myapartmentmap.com, studios in Las Vegas go for an average of $877. A one-bedroom place will cost you an average of $780 a month. Need two bedrooms? Expect to pay around $971. Three-bedroom units carry an average rent of $1,302. Whether you rent or buy a home, you’ll need to pay for your utilities. According to numbeo.com, a basic utilities package for a 915 square-foot place will cost you $177.22 per month in Las Vegas. That includes electricity, heating, water and garbage. If you want to add internet you can expect to pay around $47.78 per month. Now that we’ve covered housing-related expenses we can talk about another basic: food. Numbeo’s recommended minimum amount of money for food for one person for a month in Las Vegas is $352.74. The daily minimum is $11.38. Of course, that’s just the minimum and it assumes that you’re eating grocery store items you prepare yourself. That’s not how everyone lives. A meal at an inexpensive restaurant in Las Vegas will cost you around $14, according to numbeo.com. Want to splash out? A three-course meal for two at a mid-range restaurant will cost you around $58. Las Vegas isn’t exactly famous for its public transportation, but it does provide some options for the car-free. The Las Vegas Monorail provides service along the Strip. A single ride will cost you $5. Prices go up for unlimited rides and day passes, up to a maximum of $56 for an unlimited seven-day pass. But wait, there’s a Nevada resident discount, which a transplant to Sin City could get once he or she obtained Nevada ID. Local fare is only $1, but you’re limited in how many tickets you can buy at a time. Las Vegas has a bus system, too. It’s run by the Regional Transportation Commission of Southern Nevada. A 30-day pass will cost you $65, with a reduced price of $32.50 for youth, seniors and people with disabilities. Of course, you can always hop on one of the many free shuttles that Las Vegas’s hotels, casinos and resorts sponsor in order to lure visitors. If all this sounds like too much trouble, though, you may decide to opt for car travel. According to gasbuddy.com, the average cost of a gallon of gas in Las Vegas is $3.13. That’s a little over the Nevada average of $3.04, and 36% higher than the national average of $2.30. Nevada’s gas taxes are the 11th-highest in the country at 33.15 cents per gallon. Anyone who has gone to Las Vegas as a tourist probably knows about the city’s steep hotel tax of 12%. The city also has an 8.1% sales tax. The good news, though, is that Nevada has no state income tax. Plus, Nevada’s property taxes are relatively low. Clark County, home to Las Vegas, has an average effective property tax rate of 1.019%, according to our SmartAsset property tax calculator. In 2014, the Las Vegas Strip’s gaming revenue was $9.6 billion. Clearly, spending at casinos is a big part of life in Las Vegas. Still, behind all that spending and glamour is a tough life for many low-income residents of Las Vegas. 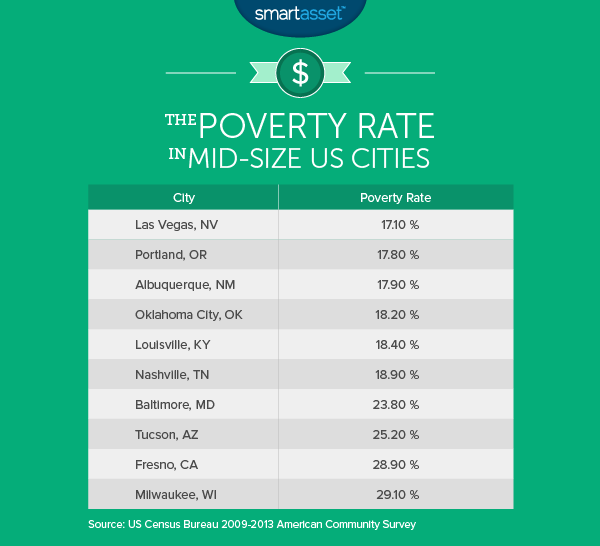 The poverty rate is high but, as the chart above shows, not as high as some other cities of similar size. Those Las Vegas residents who do have more disposable income will find that Las Vegas prices are on the high side. For example, numbeo.com estimates that Las Vegas prices are around 79% of New York City prices (excluding rent). Still, there are some deals to be had. The average monthly gym fee is only $24.56. That’s 34% below the national average. And the people-watching on the Strip is always free. If you’re thinking about moving to Vegas, it can be helpful to know how the change will affect your budget so you can plan accordingly. Your paycheck in Las Vegas may end up looking quite different than it does now. Try using our Nevada paycheck calculator to estimate what your new take-home pay will be and compare it to your current take-home pay. A financial advisor can help you navigate big life changes like a move to a new city or state, or just help you to meet your financial goals in general. A matching tool like SmartAsset’s can help you find a professional to work with to meet your needs. First you answer a series of questions about your situation and your goals. Then the program matches you with up to three advisors who meet your needs. You can then read their profiles to learn more about them, interview them on the phone or in person and choose who to work with in the future. This allows you to find a good fit while doing much of the hard work for you.